Sure, Paul Marcuccitti loves Adelaide United. But he also has an abiding affection for another A-League mainstay. Seriously. HAPPY MEMORIES: Melbourne Victory's Kevin Muscat celebrates with team-mate Tomislav Pondeljak after beating Adelaide United in the 2009 A-League final. God bless 'em! Photo: Joe Castro, AAP. We’re going into the A-League’s final round so it’s probably not the right time to do this. Yes, I love Victory and everything about that big, powerful, successful and, frankly, awesome club. Oh look, I know Melbourne’s original A-League enterprise has been Adelaide United’s bogey team for most of the competition’s history but we have to admire that rather than be bitter about it. There are also many highly respected individuals at Victory and that’s been the case since day one. Let’s start with coach Kevin Muscat. Has there ever been a more celebrated figure in the game both on and off the pitch? Come on, you jumped out of your chair when his penalty gave Australia a 1-0 World Cup qualifying win over Uruguay in 2001. And that time he bundled over John Kosmina? As if you hadn’t wanted to see someone do that to Kossie for years. What about the way he helps referees? 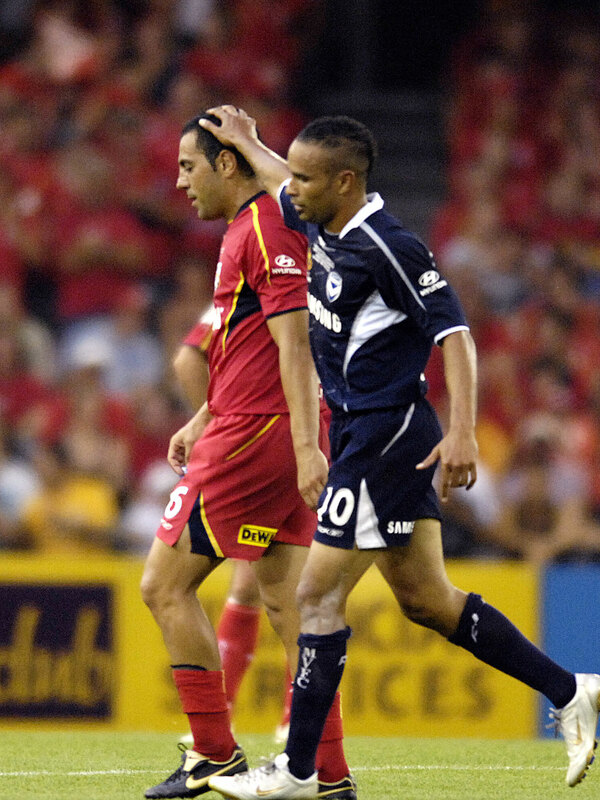 Remember when his teammate Rodrigo Vargas was felled by Adelaide United’s Cristiano in the 2008-9 grand final and Muscat raced over to Matthew Breeze to give him a calm and balanced view of the incident? Exemplary. He is charismatic; he is a leader; he is a winner. And a beautiful human being. And the world record 13 goals he scored in the Socceroos’ fantastic win over American Samoa? Admit it, you were proud. I’m fairly sure Archie loves Adelaide United too – you can see it whenever he scores against us because his celebrations are so restrained. Speaking of Victory players who score a lot, how good is Besart Berisha? Hey I realise the earth’s gravitational pull appears to be that little bit stronger when he’s in the penalty area. But his theatrics are just for his shirt, his club and his fans, right? You can’t criticise that. Actually Berisha is one of a long line of lovable players from afar who have enriched Victory and the A-League. Remember Surat Sukha? Many Reds fans were upset when his tackle on Mathew Leckie resulted in a ruptured medial ligament for the Adelaide United (and now Socceroos) star. But Sukha didn’t even get a yellow card so clearly there was nothing wrong with the challenge. And James Robinson, that journeyman from Liverpool? Certainly it’s unfortunate that the only goal he scored in 41 A-League appearances was a last minute semi-final winner that denied Adelaide United a home grand final in 2006-7. But we should see it as a compliment – obviously the Reds bring out the best in opposing players. I can’t conclude the explanation for my Melbourne Victory crush without mentioning its fans who are even more humble than an Archie Thompson goal celebration. Despite their years of dominance, they’ve never rubbed it in our faces. Yes, success on the field (the A-League’s best with three championships and three premierships) and success off it (high attendances, record membership levels and financial stability). The club is truly an example to us all. Little wonder that its hashtag for the current campaign is #InEveryWay. 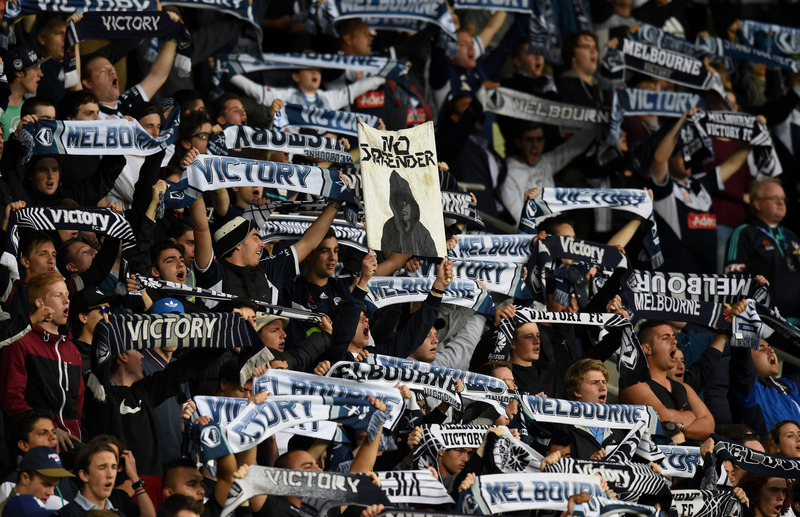 GOOD FOLK: Melbourne Victory supporters. Photo: Tracey Nearmy, AAP. Genuine success in Asia is the only thing that has eluded Melbourne Victory but that may be changing as the team has made a strong start to this year’s Asian Champions League. I want to wish the club every success in its match in Suwon on Wednesday night and for the rest of the competition. Then, when Victory returns to Melbourne, they will smash Brisbane Roar in the final round in the A-League. I am aware that, remarkably, there are still four teams in the race for the Premiership going into this weekend’s decisive games. And, my fellow South Australians, why don’t you show that you really love them as well? Paul Marcuccitti’s soccer column is published in InDaily on Mondays. He is a co-presenter of 5RTI’s Soccer on 531 program which can be heard from 10am on Saturdays.